When you think about the number of events in an Olympic Games, and the varied types and sizes of venues required for a mega-sports event like the Olympics, one wonders why we would saddle an emerging economy with such a beast of a logistics and budget burden. Sochi, Rio and Athens are recent examples of this challenge. While Japan was an emerging economy in 1964, its economy was booming and could absorb the massive change and cost with ease. And when we look at the Paris and Los Angeles bids for 2024, one gets the sense that they are at an advantage due to their already massive and modern infrastructure along with its varied and numerous sports facilities packed into their metropolitan areas. Tokyo has that advantage as well and was able to propose in its bid that 90 percent of the sports venues would be within 8 kilometers of the Olympic Village. Tokyo2020 has framed the physical footprint in an infinity loop which encloses two areas: the Heritage Zone and the Tokyo Bay Zone. The Heritage Zone represents facilities that are in and around the area of the 1964 Tokyo Olympics, the Shinjuku – Yoyogi area. That would include the location of the National Stadium, both then and in 2020. The Tokyo Bay Zone is primarily reclaimed land about 3.2 km southeast of central Tokyo. This will include the site of the Olympic Village in Harumi. 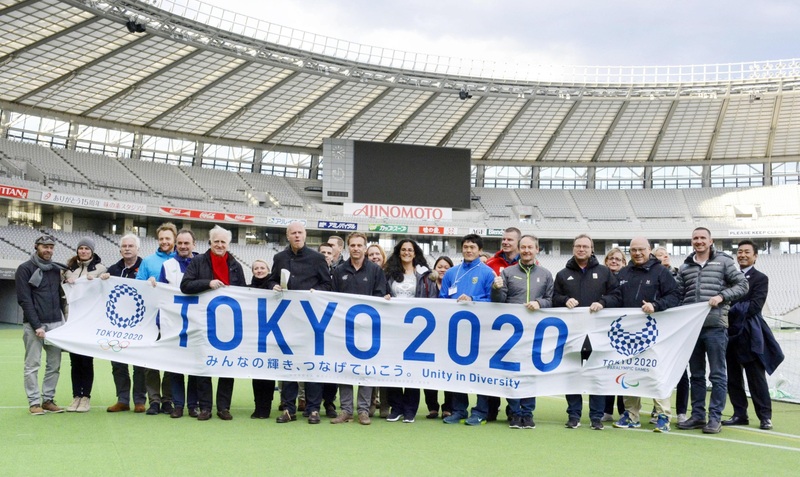 On February 10, the 2020 Tokyo Olympic Organizing Committee hosted visitors from the National Olympic Committees from Australia, Austria, Belgium, Brazil, Canada, Denmark, Finland, Ireland, Liechtenstein, Luxembourg, the Netherlands and New Zealand. For three days they got a guided tour of 26 of the approximately 40 venues planned for the 2020 Tokyo Olympics. And the reviews, apparently, are good. Across all the NOCs in the bus yesterday, everyone was saying this is going to be a good games. Everyone is confident that it’s on track, ahead of the game at the moment and will continue to be. The most impressive thing is how central 70 percent of the venues are. We were amazed at the location of the Olympic village literally being downtown. That is a fantastic opportunity for our athletes to experience the games and also Tokyo. It is a very central location to get to the venues for all our athletes. Here is a great video explaining the venue locations planned for the 2020 Tokyo Olympics. Posted in Business, Economics, Environment, Paralympics, Tokyo 2020, Tourism and tagged 2020 Tokyo Olympic Organizing Committee, NOCs, Tokyo 2020, Tokyo Bary Zone. Bookmark the permalink.